Battery Operated Security Lights Protect Your Home. Need Easy to Install Battery Powered Security Lights? Welcome to the Powerbee Range, powerful, bright, reliable & easy to Install pir motion sensor Battery Flood Lights Designed to Last Longer. You do not need an electrician to fit these lights. They are designed to be fitted by anyone in a matter of minutes. Simply choose an area and screw or stick them in place. Screws and fixings are always included in the packages. You just need a screw driver and some batteries to have instant lighting. At dusk, or if the led light is installed in a dark area, the floodlight will automatically illuminate as soon as motion is detected. Ideal to illuminate paths to navigate around your garden when it is dark, and as an effective deterrent to thieves. Reduce Battery Changing with Increased Battery Capacity. Super long lasting larger battery capacities and energy saving led's, reduce the number of times you need to change the batteries. Making life that little bit easier! These Led Floodlights are battery powered & motion activated. They conserve energy until they are needed. When motion is detected they auto illuminate, and turn off again after motion stops. In some of the larger lights, the batteries can last up to 1 Year before needing to change them. 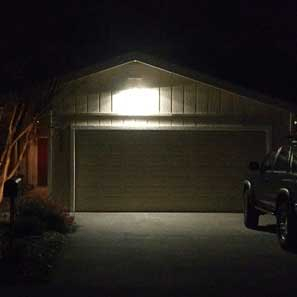 Indoor Outdoor Use PIR Battery Flood Lights. For Indoor & Outdoor use, with weatherproof options, for your home and garden. An Led Floodlight is fantastic for garages, pathways, alleyways, stairways hallways & more. Introducing a new level of power, reliability and affordability. You can rely upon Powerbee outdoor battery security lighting to protect your home & guide your path. Battery Powered Lighting is a Direct Alternative Mains. Security Lights powered by battery are a direct alternative to costly mains, they are very easy to fit, more cost effective, & work reliably all year round in the UK. A PIR (Passive Infra Red | motion activated) Battery led floodlight, allows you to Shine Bright Light, anywhere that needs it. They are so simple to fit & use, & are very effective for a whole range of uses. Also we offer a range of network lights, which can communicate with each other via radio. When one light is activated then all the network lights will activate, offering a superb level of home lighting led security. They work for very long periods of time before needing to change the batteries. Perfect as a crime prevention product, and also as a night light for the bathroom! Battery Flood Lights Keep You Safe. A motion sensor LED Floodlight gives you peace of mind, keeping your home or business safe and secure. Security Lighting has been proven in many studies to significantly prevent crime, whilst also being environmentally friendly, requires no mains energy, helps you cut energy costs, and saves you money in the process too! Each Battery Powered FloodLight is at a minimum IP44 rated, suitable for All UK weather conditions, whether it's 30 degree heat or a blizzard. Our lighting is designed to last for years to come. We use High Quality Components, down to the circuit board level, so our lights are built to last, we are CE, ROHS compliant and our factory is ISO certified. Our battery lights really are of the highest quality. We don't cut any corners, we use high grade materials, and our range is one of the best selling in the UK. Some of our first customers have Battery Lights still going strong. We have a very large loyal customer base, who once buy from us, tell us they will never buy from anyone else again!